If you think you know the Czech Republic, think again. Boasting a vibrant history, prosperous business excellence, 14 flourishing universities and a thriving cultural life, Brno is a city of innovation and diversity. It is at the heart of the South Moravian region and its 400,000 residents make it the second largest city in the Czech Republic. Whether you are here on business, immersing yourself in the opulent cultural scene, taking a stroll through Brno’s stunning parks and surrounding nature, familiarising yourself with its rich history, relaxing with a glass of locally-grown wine or visiting the adrenalin-pumped world-famous MotoGP, Brno truly is the place to be. Brno enjoys fast growing centres of business, trade, science, information technology, research and innovation with its business incubators and centres of excellence in science (JIC, CEITEC, etc.) making it a significant global contender within these sectors attracting local and global interest, as well as foreign direct investment. The Brno Exhibition Centre ranks among the largest exhibition centres in Europe, pulling in visitors from all over the world. Brno has almost 90,000 students studying at its 14 universities and 3 university campuses, their graduates provide a rich resource of employees that push the boundaries of Brno’s blossoming business sectors. Brno is the unique cultural centre of the region. It offers an abundance of permanent theatrical ensembles, opera, ballet and musical stages, as well as its world-famous philharmonic orchestra, Brno also prides itself on its wide range of museums, galleries and libraries, a recently modernized state-of the-art observatory and planetarium, a zoo and a botanical garden. More than 20 colourful theatrical and cultural festivals take place in the city each year. Brno is outstanding for its unique functionalist architecture, which includes the icon of functionalism - Villa Tugendhat, entered onto the UNESCO World Heritage List. You can find the city’s modern architecture mapped out in the project, the Brno Architectural Manual and Brno’s Architecture Day offers a rich insight into contemporary Czech and international architecture via a series of events and lectures that reach out beyond the confines of the architectural industry’s circle to engage the public with this exciting world. Brno’s coffee bars are famous for their long tradition of high-quality coffee and authentic interior designs, for example, ERA Cafe or Bistro Franz. Graphic design and visual culture have a strong tradition in Brno. Brno’s Biennale celebrates this rich tapestry of creativity, captivating its visitors through a focused and educative series of exhibitions and events that bring home to the visitors the significance of Brno’s unique participation within these sectors. Brno has played a significant role in the development of computer games. 2K Czech is a leading Central European developer of games; its title Mafia and its sequel quickly established them as a pioneering force. Amanita Design is another Brno-based developer, and the creator of the beautiful Machinarium, an internationally-acclaimed multi-platform game utilising Brno’s tradition of impressive graphic design. Brno’s musical heritage is as evident as its cotemporary musical scene is. The city is forever closely connected with the legend of Czech modern classical music, the composer Leoš Janáček. He was inspired by Moravian and other Slavic folk music to create an original, modern musical style. Brno’s ties with music continue to this day with JazzFestBrno. A leading jazz festival offering a broad range of international musicians from well-known jazz legends to inspiring lesser-known artists, often making their debuts in the Czech Republic. This well-attended festival’s programme boasts everything from the avant-garde to electronica, a truly eclectic selection of the best of the contemporary jazz world. Brno has also managed to combine the world of music with one other previously mentioned sector the city excels in, architecture. SONO centrum is the Czech Republic’s newest music centre, combines a purpose-built complex with state-of-the-art hi-tech musical facilities boasting one of the truest and most impressive sonic spaces for concerts in Europe with an eye-catching architectural flare so typical of Brno’s leading designers. Those fans of more alternative club styles can visit Fleda. Its rich programme and long-tradition among the underground dance, indie and lo-fi music scene come together to create a perfect atmosphere for first-time visitors and regular punters alike. Metro Music Bar in the centre of the city caters to those who prefer jazz, rock and DJ’ing. It opens until late and guarantees high-quality raw live power to satisfy all fans of these genres. Brno is no stranger to the literary world, its list of famous authors either born or that lived here is impressive. Bohumil Hrabal, Milan Kundera were born here and the prestigious publishers HOST and Větrné mlýny both have their homes here. Each year Větrné mlýny organises the Authors’ Reading Month combining readings for free for the public by authors from that year’s guest country with leading Czech authors in Husa na provázku theatre in the city centre. The readings are followed by an open discussion with the authors and the chance to mingle with them afterwards in the bar. The festival’s diversity of literary styles gives a good insight into the world of contemporary Czech literature and the Brno literature scene in general and lasts an entire month. Brno is bursting at the seams with productive and creative people. At the same time, extensive international experience and research has shown that the creative industries play a vital role in the development of cities. And that's how the Creative Brno initiative came into being. Its aim is to support those people working in creative professions and to empower them. This in turn brings benefits not only for them, but it also helps to develop the city and the region. Artist Kateřina Šedá, designer Petr Skala, authoress Kateřina Tučková and game designer Jakub Dvorský are considered the creative ambassadors of Brno. Kateřina Šedá’s work has been exhibited in many prestigious spaces such as the Tate Modern, Petr and Jakub are holders of the international design award and Kateřina Tučková’s books have been translated into many different languages in seven European countries (The Expulsion of Gerta Schnirch, The Goddesses of Žítková). Brno welcomes you to come and enjoy its vibrant city and its bustling creative atmosphere! 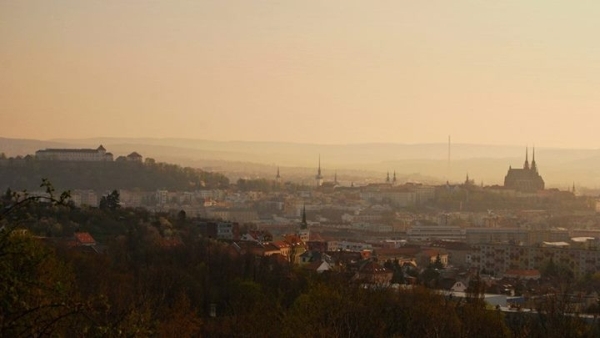 Brno is blessed with its great location – only 2 hours by car from Prague, Vienna or Bratislava making it a wonderful city for people that adore travelling. Besides this, Brno is directly connected by train to Bratislava, Budapest, Vienna, Prague and Berlin, truly making it the hub of Central Europe. Additionally, its local airport, not far from the city centre, offers many low cost connections, as well as regular flights to London, Moscow and Eindhoven. By bus, train or plane, you are spoilt for choice in your opportunity to travel about. Or the distinctive local "USE-IT BRNO" map, which is a non-commercial, up-to-date map made by young locals that really know the place. There is also the Information centre at the City hall and the Tourist centre of the South Moravia region.